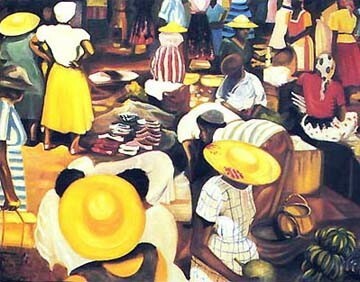 Bernard Stanley Hoyes’ professional artist career began at the early age of nine in his home town of Kingston, Jamaica. Bernard’s mother sold his wood carvings and watercolors to visitors at the Jamaica Tourist Board to help maintain the household and support his creative efforts. Hoyes first exposure to professional art education was at the institute of Jamaica, Junior Art Centre. At age 15 He moved to New York to live with his father, attend school and continue his art endeavors. He attended evening classes at the Art Students League, excelling quickly. Hoyes matured as a painter and a sculptor under the apprenticeship of established artists such as Norman Lewis, Huie Lee Smith and John Torres. A Ford Foundation Scholarship was received which allowed him to study with professional artists in a Summer Arts program at Vermont Academy in Saxtons River, Vermont. Hoyes received a scholarship to finish his academic studies at Vermont Academy for the next two years; where his work was featured in Vermont Life, Stage IV and Vermont 70 Magazines. He was instrumental in the development of a formal Art Department there and at graduation was given a solo exhibition at the Shepardson Center Gallery on Campus. Upon graduation Hoyes received the Frederick Stanley Art Award. Hoyes was invited by and given a Board of Trustee Grant at the College of Arts and Crafts, Oakland, California. He participated in the Graduate art show and received a Bachelor of Fine Arts Degree in painting and design. He set up a studio across the bay in San Francisco and became a full time artist. In 1975 he was participant in the ” Black Expo”, and assemblage of nationwide Afro-American artists. At the end of 1975 he moved to Los Angeles to work as a designer for the California Museum of Science and Industry. He later resigned in 1978 returning to his studio to work as a full time artist. He became a member and active participant in many art organizations: LACE, Artist for Economic Action, Artists Equity Association, California Confederation of the Arts, Studio Z, the Graphic Arts Guild and self-help Graphics. During the period of the late 70’s, Hoyes worked intensively on his “RAG SERIES,” encompassing over 150 pieces. 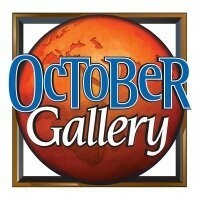 He formed Caribbean Cultural Institute and Caribbean Arts, Inc. to Further expose Caribbean culture to America. The Institute provided classes, workshops and a space for cultural events centered around an Afro-centric theme. Caribbean Arts, Inc., a publication company for graphic arts was formed which led to the creation of the “CARIBBEAN COLLECTION SERIES” and the “WALLPAPER SERIES’ where old wallpaper prints were used as a source for developing new aesthetics. Hoye’s elegant “KWANZAA HOLIDAY” card series celebrates this African American holiday with functional art was created around this time. In November 1979 Hoyes had a solo exhibition of the “RAG SERIES” at the William Grant Stills Art Center, a division of the L.A. Municipal Arts Department and a commemorative poster of “RAG NOUVEAU” was published. It has become a signature piece for the artist. Hoyes has worked with the Los Angeles Citywide Murals Programs. Some of the murals created were: “BLACK FOLK ART IN AMERICA”, commissioned by the Craft & Folk Museum (painted with the help of the children from Wilshire Crest and Carthay Elementary Schools). Other mural were created with the assistance of children from the following schools: Sven Lokrantz School for Special Children, Mc Alister High Tri-C Program and 49th Street School for the 1984 Olympics. Hoyes continues to execute Murals in the Los Angeles Community. The most recently acclaimed, “IN THE SPIRIT OF CONTRIBUTION” commissioned by First A.M.E. Church, located on LaSalle Street in the Historic West Adams District. This mural is dedicated to both African American and Hispanic people who have made note worthy contributions to the building of America. Particularly in the area of Arts and Social/Political Advocacy. In 1982 Hoyes returned to Jamaica and became a lecturer and assessor for the Jamaica School of Art under the direction of Cecil Cooper. He has a solo exhibition at the leading gallery, the BOLIVAR; which received critical acclaim for the exhibition featuring the “Rag Series.” The exhibition comprised of over 50 pieces included an oil painting of Jamaican hero Marcus Garvey, which now hangs in the Government House of Jamaica’s Commission. The work was selected by editor Robert A Hill and the University of California Press for the cover of Hill’s 10 volume work on Garvey, THE MARCUS GARVEY & U.N.I.A. PAPERS (1983). The original has traveled with the Garvey Centennial Exhibition sponsored by the Schomburg Center for Research in Black Culture to Museums across the country. By this time, Hoyes had developed into a master of colorful and rhythmical compositions. On the spiritual significance of his visually engrossing powerfully expressive works, Hoyes explains that he paints “from an intuitive point of view,” that during the process the “spirits take possession” and the ritual theme becomes dominant. These insights, his Jamaican heritage and the membership of his paternal family in “revival cults” (an Afro-Christian sect with strong African retention roots) provide cues as to why these paintings are perceived as authentic revelations of altered states of reality. The picture plane is developed from an intuitive point of view. Very little perspective is coupled with repetition and exaggeration to incorporate elements of African retention’s. Field of colors are infused with primaries in harmony. These works are intuitively inspired with no preliminary sketches. Each completed painting suggest the composition and content for the next. Color becomes personified as symbolic as various combinations are used to express national as well as spiritual connotations. The movement of the dancers is captured with posing, profiling and the preservation of facial and body expression and full figured framed against each other in dramatic crescendo. Implied lines everywhere work magic in utilizing minimum surface, textures. with much care are there to suggest/state roundness of forms, stress distances or accentuate perspective. Passionately consumed over the years with this work, a highly personal symbolism is projected that signals the arrival of a mature style. Example: “At The Table Of Zion”: this painting embraces the ritual in a spectacle of spastic bodies caught in spirit possession, around a “prepared table.” As a domestic altar, this one has a “steps feature” at the head which is unique to these cults, representing steps to heaven or steps for the gods to descend to do the bidding of mortals. From this early highlight work, a major painting with all its detailed contents is done from a bird’s eye view to give the sense of majesty and mysticism in the air. In 1992 this prepared table comes to life in an installation for the exhibition “Massive” at the Museum of African-American Art, Los Angeles and again at Cal State Dominguez Hills Art Gallery. These tables or altars connect and mediate between the terrestrial and celestial, the material and the spiritual, the personal and communal aspect of everyday life. As the work grows from painting to installation, He was able to secure nontraditional installation spaces such as in “Casualties of Contemporary Life” installed in a burnt out building in downtown Kingston, JA. (A casualty itself from the 1977 insurrection). Also done in 1992, it calls attention to the suffering and state of the downtown and its residents, socially and physically. Ironically, Hoyes came back to Los Angeles that same week in the middle of its own insurrection. In response he immediately mount “Apparition of Healing Spirits” at several fire-bombed sites around Los Angeles to help the healing process. Allure, surrender, and love are represented by “Lures” formed from chicken meshes. These transparent figures are accompanied with ceremonial platters, fresh flowers and fruit to create a healing presence in the otherwise bleak and desolate locations of the aftermath of destruction and violence. Hoyes mural works and other special projects demonstrate his commitment to the public good. He worked with First A.M.E. Church’s “In The Spirit Of Contribution,” which employed community youth, including African-American and Latino gang members, to get together to recognize each other’s contributions to the spiritual and peaceful unity of Los Angeles, California and the U.S. he developed a student art completion with the Jamaica Awareness Association and the California Afro-American Museum; founded the First Annual Jamaican Art Seminar & Gallery Tour sponsored by California Afro-American Museum; founded the Caribbean Cultural Institute and Caribbean Arts, Inc. a publishing and distribution company in 1982. The City of Los Angeles Cultural Affairs Department presented an exhibition at The Watts Towers Arts Center in conjunction with the Caribbean Cultural Institute, Division of Caribbean Arts. An exhibition honoring the 25th year of his individual artistic vision, the 25th anniversary of the Watts Tower Arts Center, the 30th year of the anniversary of Kwanzaa, and the 15th year anniversary of Caribbean Arts. Titled: “Journey Through The Spirit: 25 Years of Magical Realism.” in December 1995. For the Galerie Lakaye exhibition “Vodou Reflections.” presented in conjunction with UCLA Fowler Museum of Cultural History exhibition “Sacred Arts Of Haitian Vodou.” A ceremonial table was installed by Hoyes entitled: “Burnt Offering,” it cumulated offerings over a three month period, transforming a domestic altar-into one of personal symbolizm.